Teas that are both healing and delicious deserve big places in our pantry. 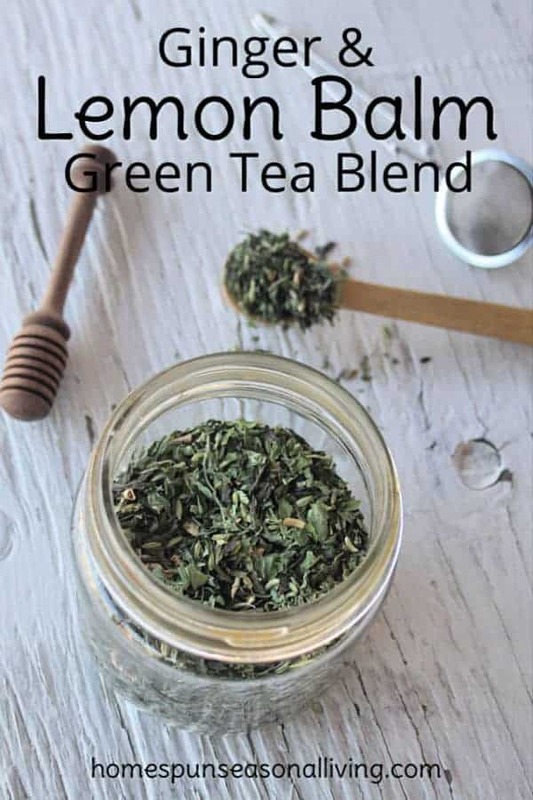 This ginger lemon balm green tea blend is sure to please the taste buds while also helping the body. Long known and used for its effect on the digestive system, ginger is the perfect after eating tea. Ginger aids digestion and eases nausea. It’s also delicious and warming. 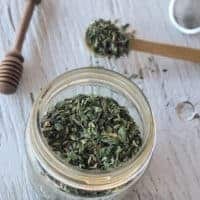 Lemon balm is a favorite herb of mine for all of its various uses. 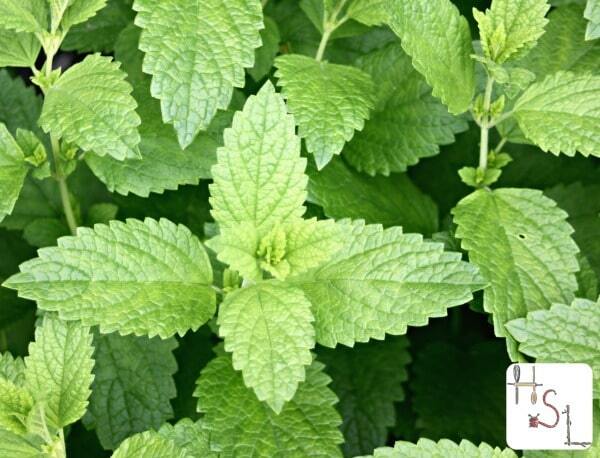 Lemon balm has long been used for its calming effect on the nerves. It adds a deliciously light lemon flavor that always goes well with ginger. There’s a lot of hype and a fair amount of scientific studies surrounding green tea. Admittedly, the whole ‘superfood’ thing tends to be trendy but there’s some real proof behind the hype here. Green tea is good for the brain and memory, may aid digestion, cuts the risk of diabetes, and much more. Fennel seed is often used to the freshen breath but it may also reduce gas and help detoxify the body. All of these benefits in a small tasty package make it an ideal complement to the other flavors in this blend. All of the digestive and relaxing benefits of these ingredients make this the ideal after meal drink. It’s simple and delicious and the act of sipping and relaxing is only likely to help the body digest small and big meals alike. The flavors of this tea are delicious and it would make a great gift. What a great way to say thanks to someone who put together a feast – a delicious and relaxing treat. For someone who travels and eats on the road frequently, this tea could be quite a healing boon. It could help the body process less than ideal or quickly eaten food and it could help calm the mind during the stresses travel often brings. Simply give the tea in a beautiful jar. Dress it up by giving it with a tea ball or drawstring tea bags. Add a jar of honey or a pretty mug if desired. 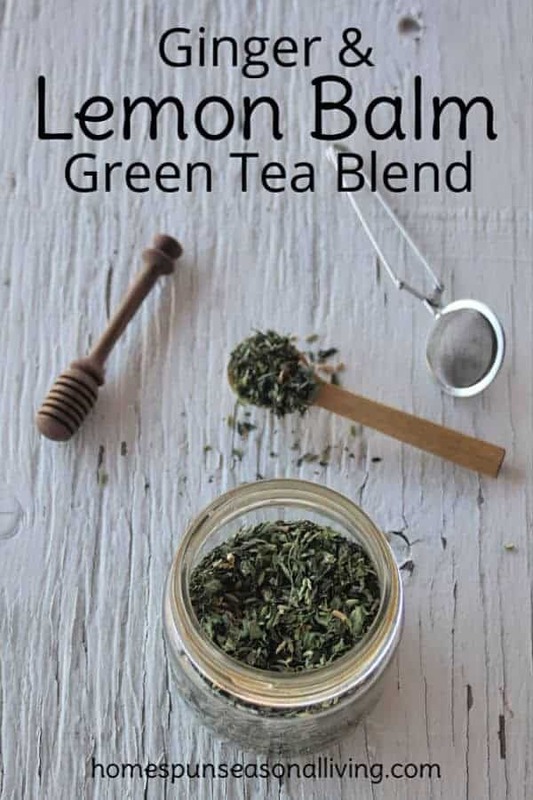 For this blend, I used the Ginger Green Tea blend from the folks at Cup & Leaf. It’s a perfectly balanced mix of ginger and green tea for my taste buds. However, any green tea would work. If using plain green tea, add 2 Tablespoons of dried ginger pieces to the recipe below to get a homemade ginger green tea blend. If lemon balm isn’t your thing, you could substitute dried lemon verbena or lemongrass. 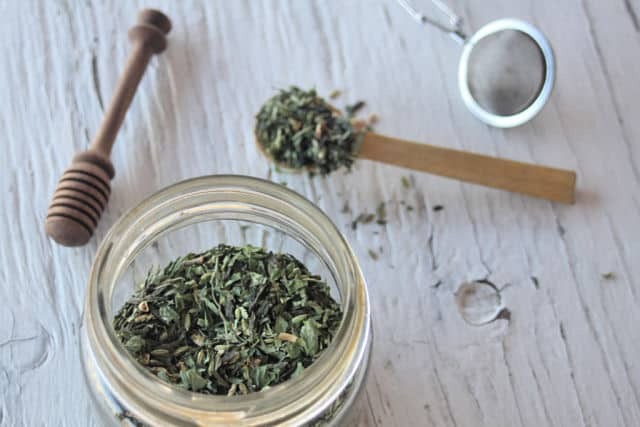 Both lemon verbena and lemongrass have similar digestive and nervine qualities while also providing the lemon flavor that goes so beautifully with ginger. 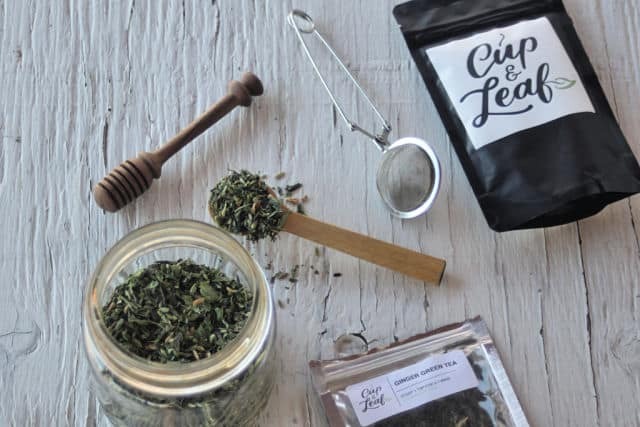 Ginger lemon balm green tea is a blend of delicious and healing herbs perfect for after meals to aid digestion and encourage relaxation. To drink, steep 1 tablespoon in hot water for 5 minutes.